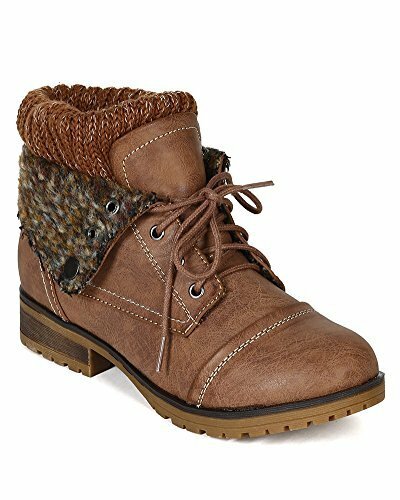 Designed with leatherette upper, round toe front, stitch details, lace up front, knitted sweater cuff, fold down faux fur collar, and treaded non-skid sole. Measurement (tested sz 6; approx. ): Heel:1.25", Shaft(w/heel): 6.5" unfolded, 6" folded, Opening Circumference: 9", Runs large, please consider ordering a full size down, Brand new with original or Alrisco shoe box.